There is a clear trend in the design and architecture industry, as well as many other industries, towards cleaner and more efficient use of energy. The problems the world is facing today due to the effects of climate change are drastic and virtually all scientists agree that unless we change something soon, we will be beyond the point of no return. So what can we do about it? How do we balance the need for prosperity and economic growth with the need to reduce our impact? Green building design is an answer to both of these needs. Groups across the world, including the U.S. Green Building Council (USGBC), are creating standards and accreditation for buildings that satisfy both. In the U.S. this is called the Leadership in Energy and Environmental Design, or LEED Certification. This article will discuss the benefits of green building design and general methods, but will then go into how you can achieve this with the help of solar technology, even more specifically focusing on the use of smart solar street lights as an easy first step forward in implementing green design practices. What are Green Buildings and what benefits they produce? Green buildings are designed to reduce the waste of resources and the negative environmental impact while increasing employees' health and productivity. Some buildings even strive to be zero-impact, becoming completely self-sustainable. Such green buildings do not apply harmful energy generation methods and minimize their waste through energy efficiency and green practices. Many people have the misconception that building green structures and saving money are still at odds with one another. This is simply not true! Besides the environmental benefits, green buildings have been shown to pay back their initial investment 4-6 times over a 20 year period. Some green building projects have made back $53-$71 per square foot over their initial investment during the same time frame. In addition, green building environments boost workers' productivity (observed when employees are working in environments they enjoy) and increase real estate and rental values in the marketplace for LEED certified buildings. I pulled three of these from National Geographic’s Top 10 Green Buildings of 2017. There are thousands more LEED certified examples to check out for inspiration online. This is really the pinnacle of smart design and it is a project that any designer, architect or builder can aspire to and be inspired by. It has extensive use of efficient LED lighting and smart lighting technology and it had already achieved a 70% reduction compared to similar office buildings. It has the largest array of photovoltaic panels of any European office building. They now produce more electricity than they consume, supply clean power back into the grid for consumption by other users. Check out more about this fascinating green building, here. 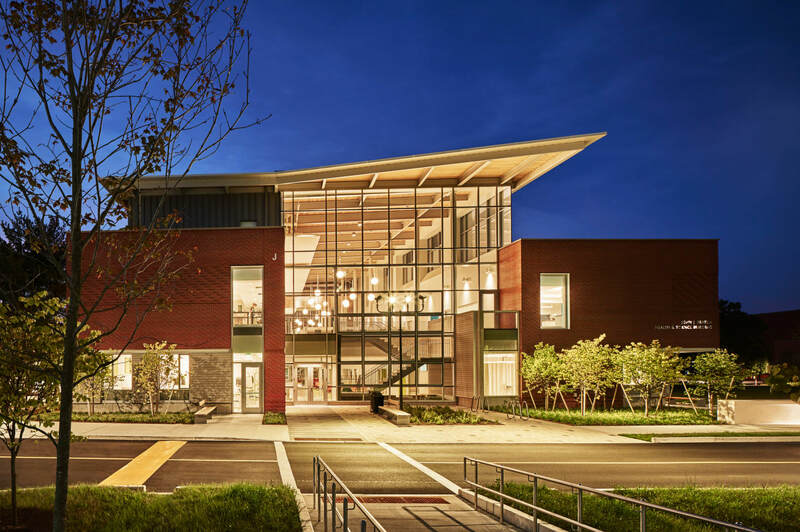 Science usually has high energy requirements, but this green building managed to achieve net-zero energy consumption. The upgrades of the building infrastructure has provided over $100,000 of operating cost savings per year. Efficient LED lighting systems are part of this green building as well. Check out more about this green project, here. For this green building, I am citing directly from the article: “The hospital's internal hot water supply and energy for landscape lighting will be provided by solar energy. Harvested rainwater will be the main source of irrigation for its rooftop gardens, while new water will be used in the cooling towers of its air-conditioning system. It is estimated that the energy saved could power nearly 4,000 five-room HDB flats for a year, while the water saved could fill about 27 Olympic-sized swimming pools.” Check out more about this green building, here. 1. How can we reduce consumption of resources by the building? 2. How can we reduce environmental impact of energy production by the building? 3. How can we reduce or reuse waste produced by the building? 4. How can we improve the quality of the human experience within the building? - Smart sensor technology: based on the time or weather conditions, automatically turning off electronics when their functions are not needed. The most reliable forms of clean energy production should be familiar to most of the people, as they have passed the stage of early adoptions and have proven to be fiscally advantageous: solar and wind. - Water collection systems: rainwater collection systems can be used to ensure that the massive amounts of usable water that come naturally can be optimized for internal building services (such as watering gardens) instead of being wasted. - Solar photovoltaic (PV): solar PV can be placed on the roof of the building to convert the sunlight into electric energy. Building designers create space and orientation on roofs and parking structures to optimize the angles of the PV panels to the sun’s path depending on the latitude and longitude of the building. Any building that achieves a net-zero impact does so with the help of PV electric generation to eliminate energy needs from fossil fuel sources. If you want to learn more about Solar PV check out this article. People produce waste. This is a huge part of the human impact on the planet. Green building designs take this into consideration by creating systems meant to reduce or reuse the waste produced during building construction and the life cycle of the building. - Material lifetime: using lighting and materials that have longer life cycles. Making design decisions that make it easy to follow waste management policies for things like paper, batteries, ink cartridges, etc. Part of the subjective and financially objective benefits of green building design involves the human element. People surveyed are happier, less stressed, more productive and even more creative in interior space designed for this reason. - Outdoor lighting: outdoor lighting is mainly important overnight so that employees can feel secure coming to work early or leaving late when the sun is down. It’s also a good deterrent against burglary if entrances remain lit — or even better, knowing when someone is there and intelligently illuminate the space when light is needed. It has been shown that LED lighting creates brighter, more day-like illumination that makes people feel more secure than traditional street lighting (which is darker and yellowish). We will explore smart street lighting further in the next section. 1. What are smart solar street lights? 2. What do they have to do with green building design? 3. Why focus on smart solar street lighting in my design or construction project? 1. What is Smart Solar Street Lighting? - Are intelligent to know whether to be on or off (and how bright) based on surroundings and presence of human beings. Learn more about remote control of solar street lighting systems here. So, what does this have to do with green buildings and green building design? Everything! Smart solar street lighting is able to hit on every goal of a green building. - Human Experience: the safety and security of your tenants is important to their comfort. Higher quality lighting in outdoor spaces means they won’t feel scared walking to their car in the parking lot or strolling the rooftop gardens in the evening hours. 3. Why Focus on this in My Project? To put it simply: it is highly impactful, it contributes to LEED certification and it is very easy! - Impactful: outdoor lighting generates an enormous use of energy in large buildings and spaces - especially when it comes to outdoor lighting for parking lots and walkways that must provide illumination from dusk till dawn for security purposes. - LEED Certification: the USGBC’s Leadership in Energy and Environmental Leadership credits (LEED credits) are awarded based on a percentage of on-site energy consumption that is produced by renewables. Smart solar lighting reduces onsite consumption and increases onsite production, helping you to move closer towards LEED certification. Learn more about LEED certification with Smart Solar Street Lights. - Easy: Smart solar street lights are meant for outdoor areas. So, it does not take significant redesigns or customization to incorporate them into your green building project. If the building is already constructed, such replacement and/or addition will be easy to implement and quite impactful in terms of clean energy generation. Additionally, part of the financial benefits of green buildings is their marketability and “curb appeal”. Imagine having the first thing guests experience when they enter your building, being at the parking lot or the walkway, lined with solar powered lighting that is intelligent enough to brighten the path just ahead of them and then dim the light after they have passed. That is a strong, visceral experience to impress, beyond just your LEED certification. How Smart Solar Street Lights fit into Green Building Projects? I’ll keep this brief because you’ve been stalwart enough to read this far, you deserve a reward! - Green building benefits are both environmental and financial, yielding huge returns on operational expenses over the long run, increasing building marketability and improving employee productivity and turnover. - There are many ways to design green buildings and many examples of green buildings to inspire your next project. A significant step forward would be to focus on improving your outdoor lighting and implementing smart solar LED street lighting. - Smart solar street lighting is impactful, contributes to LEED certification, and it is easy to implement! You’re clients, employees and friends will love you for the positive impact and the considerations you make for improving sustainability in your next green building project. Please comment to ask any questions about smart solar street lighting, share your own ideas for green building innovations or give us feedback about the article!